*Must pay 2019 Society membership dues. * To qualify as a student, one must be a full-time graduate student, medical student, or student in the first two years of a postdoctoral fellowship program at a university, in a field relevant to schizophrenia research. A letter from the student’s immediate supervisor verifying his/her status and relevant field will be required for upload within registration. * A spouse, relative, or significant other (age 18 & older) who accompanies an attendee. An accompanying person may only attend the social functions of the meeting, which include the morning buffets, lunches, and receptions. You must pay the accompanying person fee to attend the social functions. The only scientific sessions open to the accompanying persons are the poster sessions. PLEASE NOTE: An accompanying person cannot be a scientific colleague. * Each additional reception ticket purchased will allow access for one individual to the Opening Reception. The Opening Reception is included for all registered attendees and registered accompanying persons. In the event of registration cancellation, please send an email to the SIRS Executive Office at info@schizophreniaresearchsociety.org. Notification of cancellation must be received by 4 March 2019 in order to receive a refund less a $50 USD processing fee. Cancellations received after 4 March 2019 will not receive a refund. For any additional questions regarding online registration, please contact the SIRS Executive Office at info@schizophreniaresearchsociety.org. 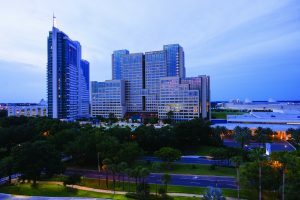 Hyatt Regency Orlando is in the heart of everything Orlando, Florida has to offer – theme parks, shopping, dining, and nightlife. The hotel includes two pools, a full-service spa and salon, StayFit™ Gym, tennis courts, bicycle rentals, and 7 restaurants and bars. Two Resort Pools: The entire family will enjoy a spectacular pool experience with a waterslide, waterfall, splash pad, separate kiddie pool and poolside cabanas for rent. On International Drive & Near Attractions: Explore with two daily I-Ride Trolley tickets to I-Drive locations including Pointe Orlando, I-Drive 360, SeaWorld and Aquatica. Plus, we are minutes from Universal Orlando Resort and Walt Disney World Resort. Vibrant Dining: Indulge in locally inspired cuisine with five full-service restaurants, two bars, a grab & go market and 24-hour room service.